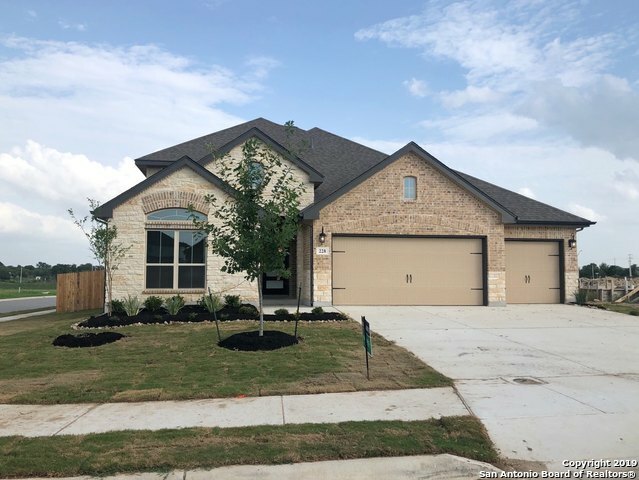 All Cibolo homes currently listed for sale in Cibolo as of 04/25/2019 are shown below. You can change the search criteria at any time by pressing the 'Change Search' button below. "The Value in this Property is in the LAND. 5.087 acres that is zoned SF-3. This property can be subdivided into smaller lots for additional homes. The current home can be used as a carrier for developers while working on development plans. The 2nd floor of the house and the upstairs of the garage are completely unfinished space. 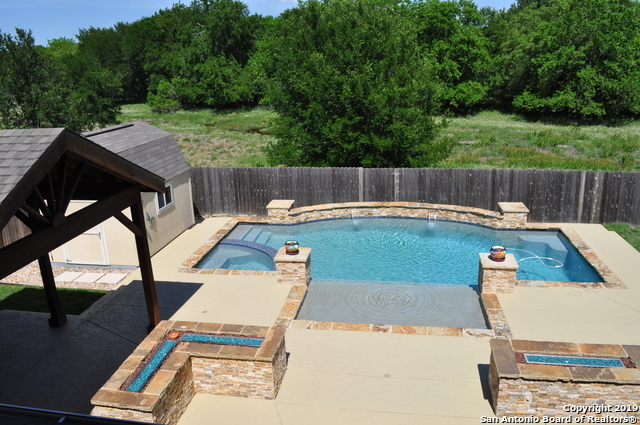 Fantastic location next to Schlather Intermediate School. The potential for this property is exponential." "Three acres with a 2005+sq ft house. Great commercial value..a must view property. Old barn in the back"
"The Edinburgh II home plan is perfect for your family! This floorplan boosts 3,499 square feet and features 5 bedrooms, 4.5 bathrooms and a tandem 3-car garage. Your fabulous formal dining is located right in the middle of the home, which allows you to entertain your guests with ease. You can add french doors to your den to convert it into a study. The kitchen has a huge oversized island with many cabinets and countertop space to prepare your favorite meals." "One of Chesmar's Best Open & Functional Family Floor Plans! 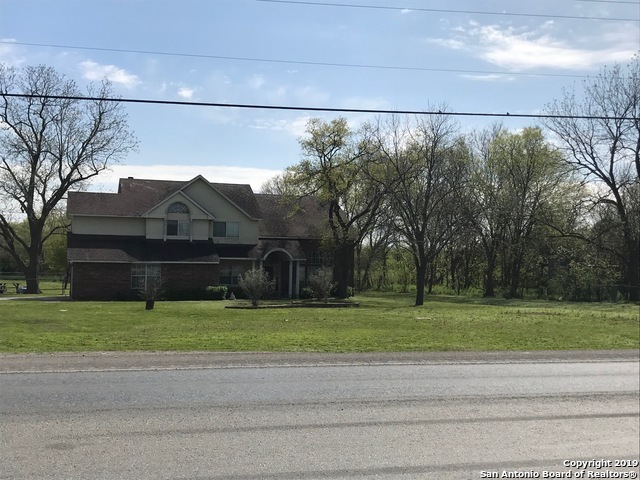 This 4+ Bedroom (Office can be 5th), 4.5 Bath, 3 Car Garage, Family, Den (muti-fuctional between bedrooms), Office, Gameroom, Dining & Breakfast & Beautifully Upgraded! 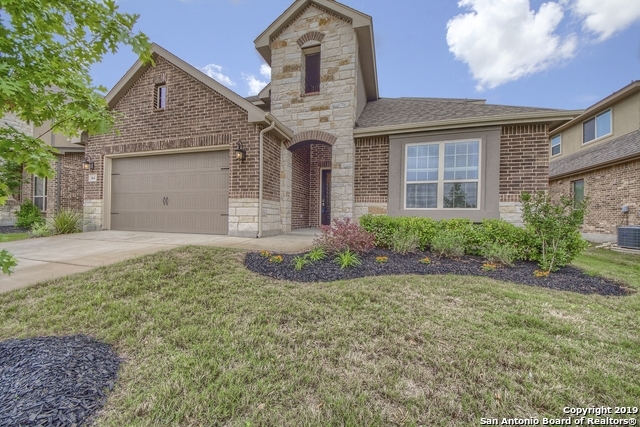 Close to I 35, Great Schools and Shopping and minutes from Downtown Cibolo. Same model has a starting price of $470+ (w/o upgrades)." "ou have arrived! This home has it all with 5 bedrooms including a master suite, second master, 3 additional secondary bedrooms, 4.5 baths, study, formal dining, media room, game room, and 3-car tandem garage! The kitchen, which is open to the family room, boasts an oversized island with granite countertops and built-in appliances. This home also includes a 20-ft floor-to-ceiling stone fireplace and lots of extras such as iron railing, crown molding, wood-looking tile, and 8-ft interior doors." "This 2-story home boasts from 3,707 square feet of functional living space. 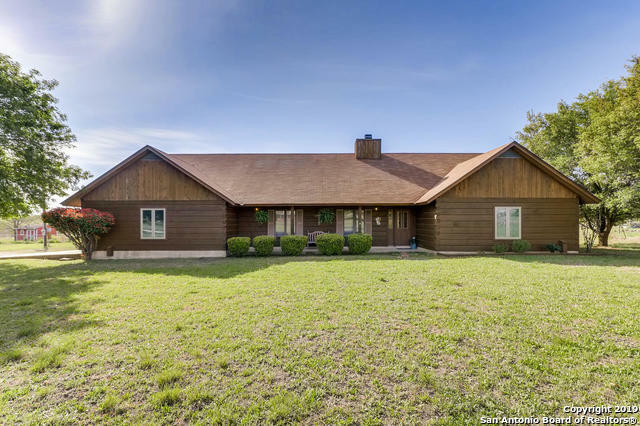 This home features 4 bedrooms and 3.5 baths. You are welcomed by a large foyer with a secondary suite tucked away near the entrance. Also on the first floor is the master suite." 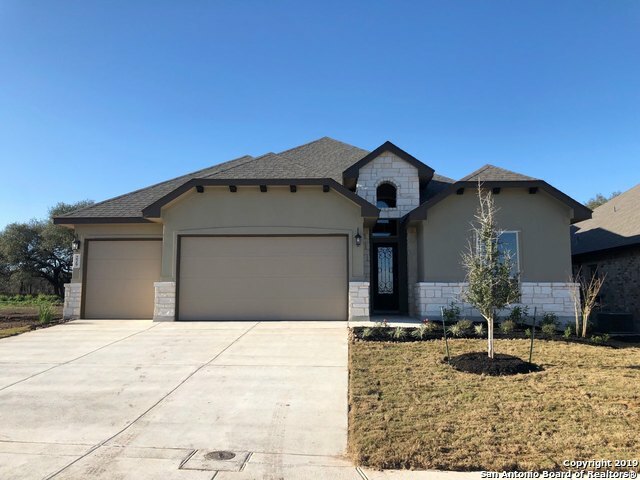 "PREMIER LOCATION**BEAUTIFUL GREENBELT**PERFECT SUN ORIENTATION**OWN THE BIG HOUSE (4 LIVING AREAS) W/THE GREATEST POOL...IN MOST DESIRABLE NEIGHBORHOOD IN CIBOLO**GRANITE KITCHEN W/DBL OVENS**5 BEDROOMS & 4 BATHS**HUGE MASTER*DBL VANITY*WALK-IN SHOWER*LGE MASTER CLOSET**2ND BEDROOM DOWN W/FULL BATH**JACK-N-JILL BEDROOMS UP W/ADD'L BATH & BED**GAMEROOM UP**MEDIA ROOM OR OPT 6TH BEDROOM**TONS OF STORAGE**OVER 85K QUARTZ-GUNITE POOL, SPA, 2 FIRE WALLS & 14X14 CEDAR GAZEBO**WTR SOFTENER**SPK SYS**LA"
"2 Story w/ Master Bedroom Downstairs along with secondary bedroom and full bath down. 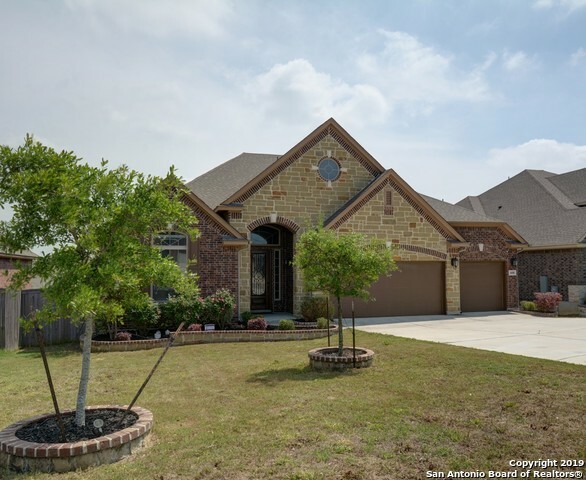 Total of 4 Bedrooms, 3 full baths, 1 half bath, family room with 8' doors on the first floor, vaulted ceilings at entry and breakfast nook off the kitchen. Downstairs is also a formal dining area with a pass thru into the butlers pantry and kitchen. The large Game Room and Media Room makes this the perfect home for family entertainment. 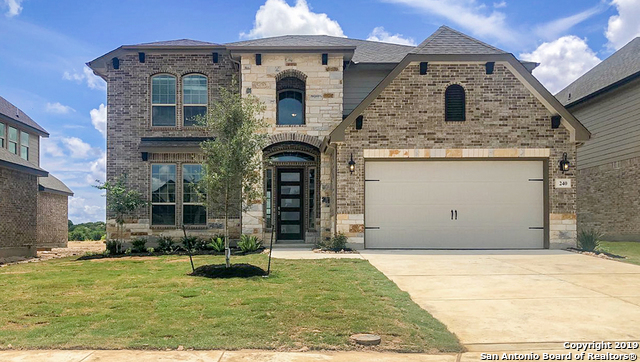 This home features granite countertops in the kitchen, 42 J-Kraft Custom"
"Home LIKE NEW **FULL 5 Bdm plus OFFICE, PLUS 4 FULL BATHS * Master, guest suite, and office are DOWN**3 bedrms plus FM RM is up* EXTRAS everywhere = Soft Water Sys, Sprklr ys, Granite counters, wrought iron ballisters* Beautiful tumbled stone backsplash** Lots of Storage** Covered Patio * No neighbors in front or back--Ranchito behind you**42in cabs *Double oven** Elegant vent over cooktop* Home is BARELY lived in-months only!! *10' ceilings in FM rm *8ft doors downstairs--Excellent craftsmansh"
"2 Story Home - 4 Bedrooms, 3 Full Baths, 1 half bath. This home has the Master Bedroom & a guest suite downstairs. There are two bedrooms upstairs with a jack-n-jill bath and a Media Room. This home features granite countertops in the kitchen, SS double ovens, 42 J-Kraft Cabinetry, wrought iron metal balusters. This home has a large covered patio in the back." 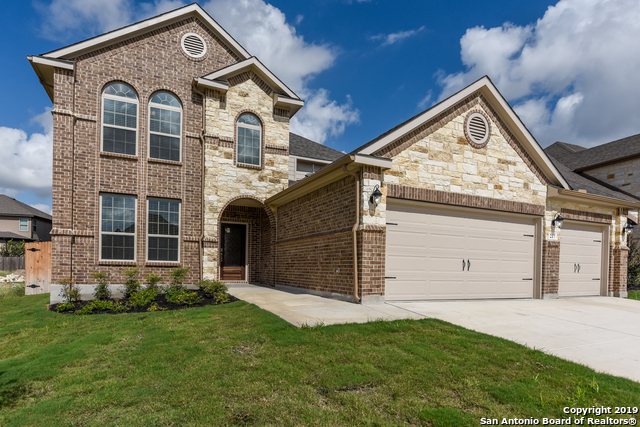 "2 Story home - 5 bedroom, 4.5 bath home features 3066 of living space. Study downstairs with glass doors. 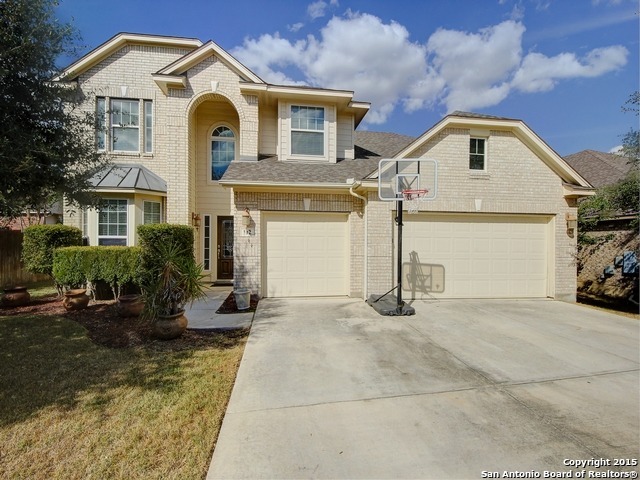 This beautiful home has 2 story high ceilings in the family room. This home features granite countertops in the kitchen, 42-inch J-Kraft cabinetry, very large kitchen island and built in stainless steel appliances. This home has a covered patio in the back." 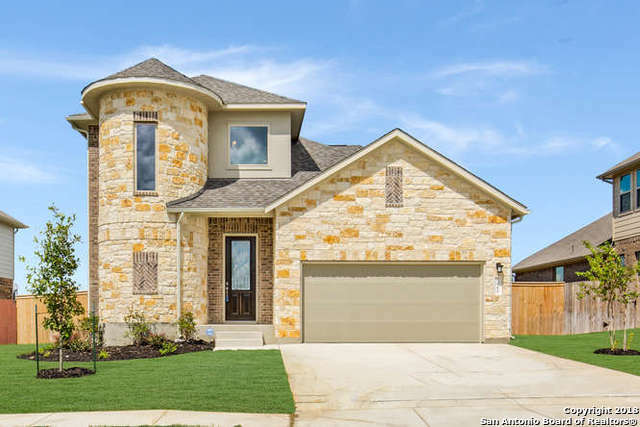 "This one and a half story home boosts from 2,778 to 3,143 square feet of functional living space and features 3-5 bedrooms, 2-4 bathrooms, and many other customizable options. When building this home you have the option to turn the study into a fourth bedroom with a third full bathroom. Tucked away in the back of the home is a spacious private master suite. Increase your master suite in size by adding a bay window. In the master bathroom, you will find a very large walk-in closet, a walk-in show"
"The Kitchen has the option to make it deluxe, which adds a built in oven and microwave. The kitchen also opens to a breakfast area and a huge family room that has the option to add a fireplace. In the master bedroom, a bay window can be added for even more square footage. Upstairs, there is the game room, with the ability to add a balcony, and there is also an option to add a media room. See how The Osprey II floorplan can meet your needs." 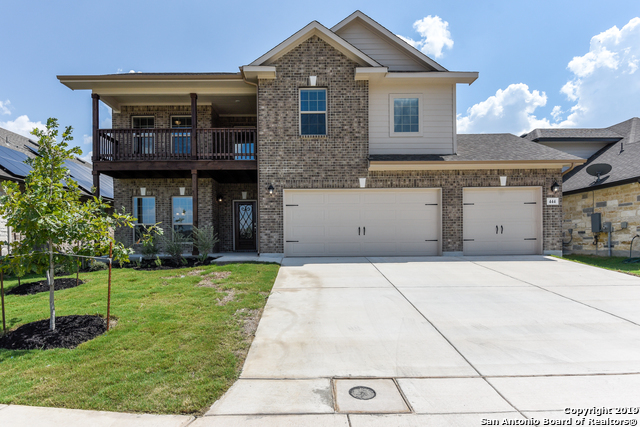 "This two-story, 6 bedroom, 3.5 bath home features 4369 square feet of living space. The first floor offers a welcoming entry way leading to a private study, beautiful stairway and open dining area. Beyond the dining area is a spacious eat-in kitchen that flows into a charming living room extending out to a large covered patio. Off the living room is a private hallway connecting a powder bath and utility room. The master suite is located off the kitchen area and features a nice master bath and wa"
"Gorgeous and ready! 4/2.5/3 Spacious rooms beginning with the entrance. Granite counter tops with bricked counter walls in the kitchen. Dual ovens, built in microwave oven and lots of cabinets. Rounded corners, arch ways throughout. Customized for comfort. Covered patio overlooking an over sized well manicured backyard complete with an in ground pool with a beautiful walkway. This home is loaded with plenty of extras in this house. Worth the trip to go see it!" 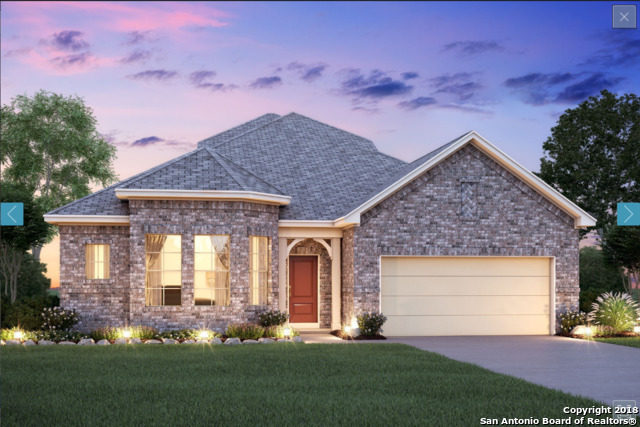 "The Kestrel floorplan is a 2-story home that boasts 3,089 square feet of living space and features 4-5 bedrooms, 3.5 bathrooms and a 2-car garage. Upon entering a spacious foyer, there is a bedroom tucked away privately with a full bathroom. You may have the option to make the adjacent flex room a fifth bedroom or a study depending on your needs. Continue through the entryway and you'll find the kitchen, breakfast area, and family room which were designed with entertaining and family time in min"
"Onsite Elem school and enjoy resort style amenities (pool, playground, tennis, basketball and sand volleyball courts!) Home has a section of greenbelt behind it. 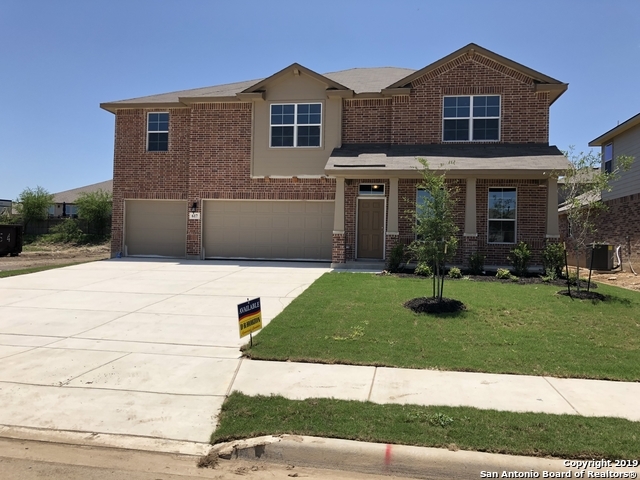 3-car garage, wood in study, broken joint tile in all wet areas, & familyroom, SS appliances, covered patio, granite in kitchen AND all full baths! Home is currently under construction and will be completed April/May '19." "Onsite Elem school and enjoy resort style amenities (pool, playground, tennis, basketball and sand volleyball courts!) Elevation F1, home has a 2nd floor balcony on the front overlooking a greenbelt across the street. 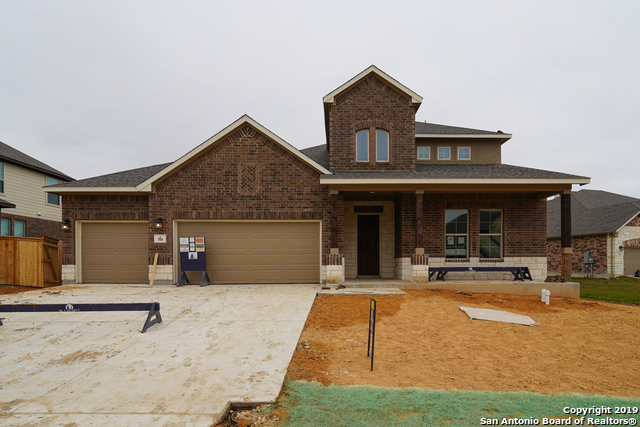 3-car garage, tile in all wet areas, & familyroom, SS appliances, covered rear patio, granite in kitchen AND all full baths! 5th bedroom is down stairs and can be used as a Study. Very large gameroom. 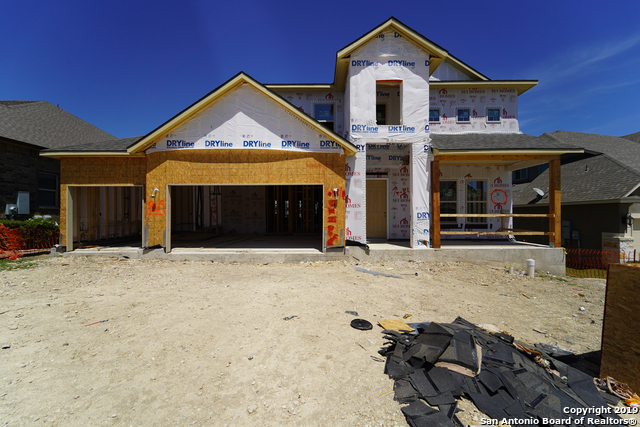 Home is currently under construction and will be completed April/May '19"
"This home features 3079 sq ft of living space. Upgraded to 10 ft ceilings. Custom 42-inch cabinets, granite counter tops and custom ceramic tile back splash in kitchen. Built-in Frigidaire stainless steel appliances, including double oven. Skybell doorbell camera and z-wave thermostat. Covered patio with full house gutters. Fenced, sodded and landscaped, with full-yard irrigation system." 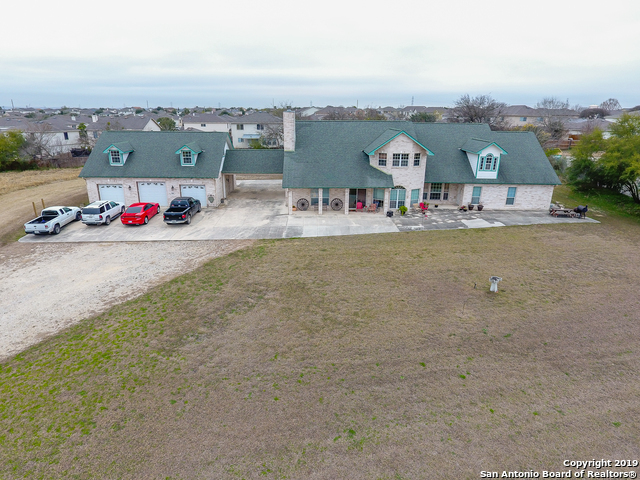 "Over three acres inside Cibolo City Limits! This charming 3 bed 2 bath custom log home has been meticulously maintained. It is situated between Cibolo Valley Drive and 1103 on Green Valley. Home has a 1 year old roof. Enjoy country living while being close to the city amenities you have grown custom to having near by." 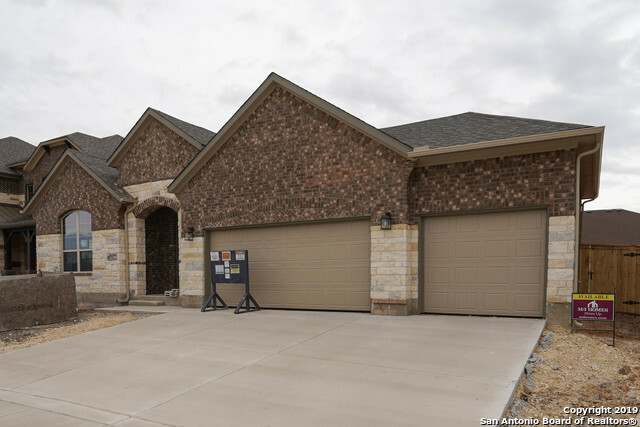 "This show stopping home features a Turret on the exterior stone elevation and vaulted ceilings, wood floors and study off entry with wood beams. Family room and kitchen are open to one another making the flow of this home perfect. Upstairs features 3 bedrooms, 2 baths and a loft game room. Master bedroom features bay windows, his and her vanities with both a walk in shower and a separate garden tub. Backyard opens up to trees from warbler way bird sanctuary giving you a peaceful feel. Available "
"Onsite Elem school and enjoy resort style amenities (pool, playground, tennis, basketball and sand volleyball courts!) Home is located near the end of a dead-end cul-de-sac street. 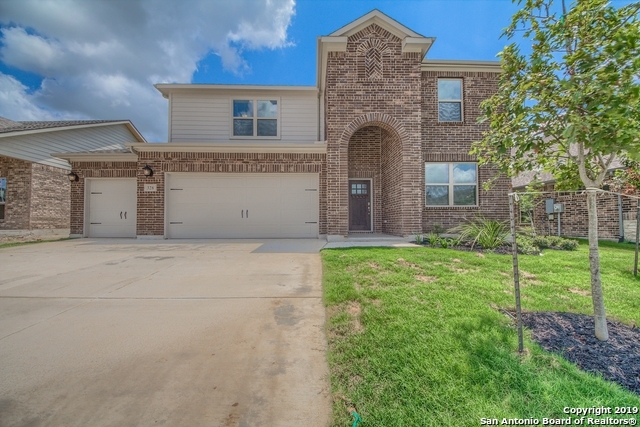 3-car garage, broken joint tile in all wet areas, familyroom, and flex, built-in SS appliances, covered patio, granite in kitchen AND all full baths! 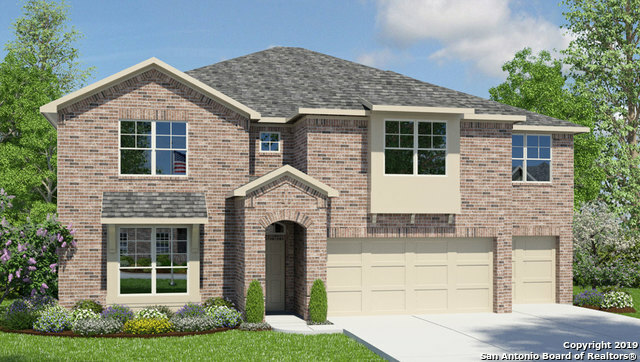 Home is currently under construction and will be completed April/May '19." 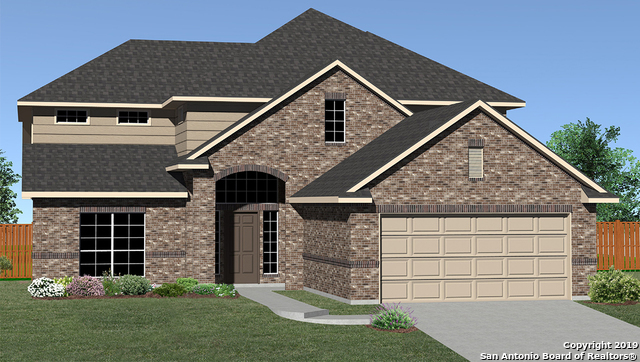 "This 2-story, 4 bedroom, 3.5 bath home features 3649 sq ft of living space. The first floor offers an entry way that leads to a study, utility room and powder bath. The entry hall opens to an eat-in kitchen, dining area and a living space that extends to a covered patio. The master suite is off the living area and features a master bath with walk-in closet. The second floor highlights an open game room area, private media room and storage area. 2 full baths and 3 bedrooms are located off the gam"